Planning to spend time in the great outdoors? Then plan ahead and pack your JoeShade portable umbrella and “stay cool” and protected from harmful sun rays. Whether you’re a camper on a quest to see every single national park or an RV enthusiast on a journey across the country to see the sights of the open road, a JoeShade portable sun shade umbrella is the perfect addition to your outdoor excursion. Taking one with you makes any outdoor activity a relaxing getaway in the shade. Whether you’ll be climbing cliff faces or hunting for your next great camping spot, JoeShade will help you make the most of your trip. Set yours up at base camp or take it with you while you fish. No matter where you’re headed you’ll be glad you brought it along. JoeShade makes it easy to relax while you grab a breath of fresh air and take it all in. When you’re enjoying the great outdoors you have to be mindful of the sun, which can be tough in all conditions. Thankfully, the JoeShade’s wide base and tripod stand give it sturdy and stable support, letting you set up your portable shade with ease whether the ground is flat and grassy or rough and rocky. The generous canopy measures 60” in diameter and its tilt function gives you protection from multiple angles, providing copious amounts of shade no matter how tough the sun gets. Even if your getaway means strong winds, JoeShade offers stability with its efficient design. The broad base and wind vents help it stand up to the windiest days, while the optional stakes let you dig in for support wherever you are. With its incredible versatility and adjustability you’ll never have to worry about being bothered by the sun glare again. 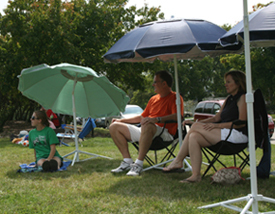 JoeShade offers generous amounts of shade combined with a highly configurable stand that let it stand tall. Able to go anywhere, it makes a great addition on any outdoor excursion. Its lightweight nature makes it easy to fold up and take just about anywhere. Pack it up in the matching carrying bag and you’ll discover how easy it is to store. We designed JoeShade to not only offer plenty of shade, but to be a convenient addition to any trip that’s easy to setup. 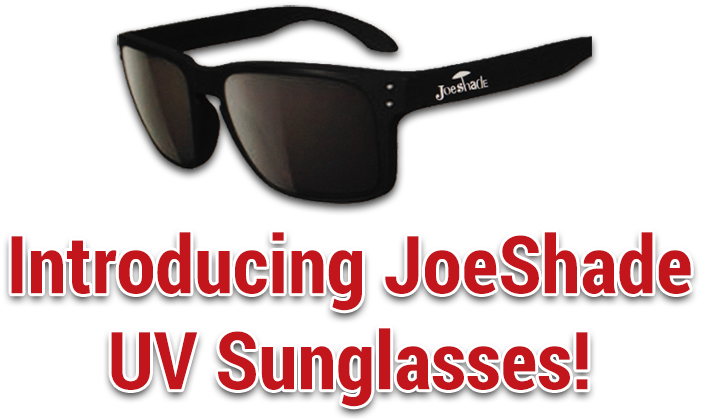 Stay cool and protected from the sun and its harmful UV rays – grab a JoeShade and you’ll be able to take the shade wherever you go.